Lack of archaeological evidence questions using 2200 BCE as a threshold of the new Meghalayan geologic age. American Association for the Advancement of Science (AAAS)—The creation of a new division in the scale of geological time – the Meghalayan Age, a period beginning with a two-century megadrought in 2200 BCE that allegedly led to the collapse of several civilizations worldwide – was recently announced by the International Commission of Stratigraphy. In a Perspective*, Guy Middleton argues that the archaeological and historical evidence does not support the widespread collapse in which the Meghalayan is based. According to Middleton, this lack of evidence casts doubts on the utility of using 2200 BCE as a meaningful threshold of a new geologic age. Large amounts of paleoclimate data suggestive of the existence of a megadrought have been casually linked to the collapse of civilizations for decades. However, these environmentally deterministic interpretations often fail to account for specific historical circumstances or the power of human agency to translate environmental factors into cultural and socio-political contexts. 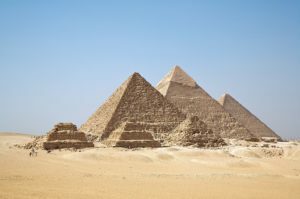 For example, the ‘collapse’ of Egyptian civilization is often provided as evidence of the impact of the Meghalayan megadrought. According to Middleton, there was no great disruption to Egyptian society during this time, but rather a reorganization of political power. Furthermore, the ancient literary sources that have been cited as evidence of drought, famine and unrest during this time – were written far later and with a purpose of supporting the centralized power of a Pharaoh; they cannot be accepted at face value. Middleton suggests that archaeologists pursue more interdisciplinary collaborations and publish in journals so current understandings are visible to the wider discourse. *”Bang or whimper?” by G.D. Middleton at Charles University in Prague, Czech Republic; G.D. Middleton at Newcastle University in Newcastle upon Tyne, UK.